Setting a “mode share target for walking and bicycling” is a major change in policy yes and one our readers and the bike industry are certainly interested in. We talked livable cities, making cycling safer and sustainable, amongst other topics in Austin, during SXSW. Our Mobile Social attracted hundreds of cyclists in a fun, social ride. For an afternoon at least, cyclist pwned SXSW and rode all over that town. We believe here that too and in the bike as a connector. It’s also a solution to lots of complicated problems. Last year at TrekWorld, I met Burke and Oberstar who work very hard at advocacy and are into the bikes just as much as we are. Now we need to work on making our efforts coordinated and sustained and start thinking of marketing the bike for transportation, to get America in shape, and make the cars and bikes equal. Maybe even ride in the draft of Health Care reform. To do that, companies have to get out of their sports marketing boxes and rethink what they do. If Zooey Deschanel can walk around in a Cotton ad with a basket bike, couldn’t a bike company do that too with their new urban line? Madison Avenue is using bikes to sell the idea of products and the industry is not. My reaction to ESPN wasn’t “kill the cars and the assholes driving them” but we’ve got a PR problem us cyclists. 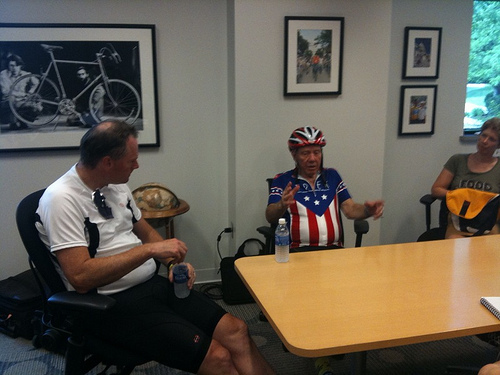 If we were at the National Bike Summit, would use stories like the ESPN radio commentator as a call for a new approach. It’s a PR problem. The problem is that what was said on the radio millions of drivers think and feel. What are we going to do about that? Tweet angrily back, start a Facebook antifan page, shake our fists, or work on another approach to advocacy? I’m promoting and advocating the bike with this blog and Mobile Socials at various design conferences. I believe in it.